Tokyo, June 11, 2014 – Fuji Heavy Industries Ltd. (FHI), the maker of Subaru automobiles, and Subaru Tecnica International Inc. (STI)*1 will participate for seven consecutive years in the Nürburgring 24-Hour Race to be held in Germany from June 19 to 22, with the new "Subaru WRX STI NBR Challenge 2014", a racing car developed based on the all-new WRX STI. FHI and STI will aim at its third victory in the SP3T class this year following the 24-hour race in 2012. The Subaru press conference will start at 4:00 PM (Central European Time) on June 20 in the lounge space of Nürburgring circuit. This conference and the race will be streamed at the special site and the Subaru-Ustream*2. ■ "Subaru WRX STI NBR Challenge 2014"
Since its first model was born in 1992, the Subaru WRX series has been supported by sports car fans in the world as a unique sedan with both four-door practicality and overwhelming sports performance. While the "Subaru WRX STI NBR Challenge 2014" employs special parts and is also tuned for endurance race, it uses the same core parts as the ones employed for the mass-produced WRX STI. By further enhancing mutual cooperation between FHI and STI, the development of a racing car based on the all-new WRX STI which has just been unveiled was achieved. 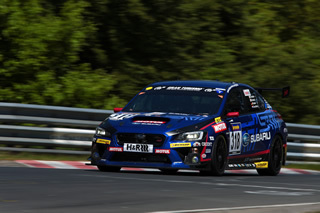 By venturing to participate with a racing car developed from a mass-produced model, Subaru will demonstrate that AWD (All-Wheel drive) sports performance of the all-new WRX STI is fully provided even on the Nürburgring circuit known as "ultimate public road". Through its motorsport activities, FHI and STI will continue to pursue engineering excellence to assure "Enjoyment and Peace of Mind" to customers worldwide. Live broadcast through car-mounted cameras; local official video; interviews with drivers and dealer mechanics. *3: Time is subject to change, Central European Time. *4: 24 hours, plus 1 hour before and after the final.